← Best iPhone Wallpaper… EVER. Purchasing a massage table can be a very daunting experience for people, regardless if they are professional therapists looking to replace one or non-professionals who want something to work on their friends and family. There are SO many brands, models and options out there, it’s easy to feel confused and overwhelmed. As a distributor as well as a trained massage therapist, I feel it’s my duty to help people find the table they will love – that fits their practice AND budget. I am more than happy to answer questions, and if I don’t know the answers, I’m even happier to research the answers for them. There is nothing like getting that call from someone I helped telling me how much they absolutely LOVE their table package! If you’re in the market for a massage table, there are several questions you’ll want to ask yourself before making your final decision. Am I an in-home user or a professional user? There are many tables on the market, but often they are built for different usage. Are you planning on having 2 or 3 people a week get on and off your table? Then a low-cost, in-home table will work well for you. Are you planning on working on 20-30 people a week? Then a professional table is highly recommended. One thing to remember: it’s best to avoid the super-cheap massage tables from warehouse stores. Time and time again I would hear of massage students who have limited budgets opting for these only to realize their mistake within months. Most of those tables are made overseas, so there is no company in the US to handle problems, and the quality tends to be very low so not only will the table feel wobbly (or will after a short amount of time), but it may also end up squeaking. The LAST thing you want if for your clients, whether they are paying for a professional massage or it’s your significant other, to feel unsafe, uncomfortable or irritated no matter what kind of deal you got. If you decide you are an in-home user looking for a good quality table and a lower price, there are several available. Many people find the Oakworks One and the Inner Strength Element packages good table packages to consider. Both companies have corporate offices in the US and their products are backed by warranties. Will I be traveling to clients or staying in one place most of the time? The next question to ask yourself is how often you believe you will be moving your table. Will you be packing it up after each client and going to the next one or will it be positioned in a massage room and moved infrequently? The weight of a portable massage table can greatly affect a therapist, and hauling it from one place to another can take its toll. For mobile therapists, it’s best to consider lightweight tables, such at the Oakworks Wellspring, Earthlite Spirit LT or even the super-light Pisces New Wave II Lite. Lightweight tables are often a little more expensive than other tables, because the engineering that goes into them is a testament to the materials that maintain strength and durability. For a more stationary table, therapists have a broader range to choose from. Table options also come into play more. How do I choose what options are best for me? HEADREST: Most companies offer standard headrests and adjustable headrests, often with cushion upgrade options. I find that our customers overwhelmingly prefer adjustable headrests for the simple fact that tilting the headrests down slightly makes it much easier to access the back of the head, the neck and the shoulders. Cushion upgrades are usually a memory foam (similar to the popular memory mattresses), and Oakworks offers a very comfortable Boiance upgrade (I purchased it with my massage chair and I love it!). PADDING: The padding options on tables can range from firm to extra plush. Will you be working on athletes? Then lean towards more firm padding, so your clients do not sink in when you are working on them. Are you inclined to give more luxurious, relaxing massages? Then consider upgrading to more plush padding – there is nothing like the pampering feeling of settling into a plushly padded table. Not sure where your career is headed just yet? Then compromise with a padding somewhere in the middle. TABLE WIDTH: Most standard tables are 29″-31″, though there are a few that are much more narrow or much wider. I have had customers agonize over the choice of 29″ or 31″, so what I tell them to consider is their own height. If the therapist is more petite, and especially if they plan to take the table to clients, it’s best to go with a more narrow table. However, if the therapist is taller, or if the table will likely remain stationary, clients will usually feel more comfortable on the 31″. UPHOLSTERY COLOR: This is also where I see many customer get stuck. Some want their table to match the room decor, some want one they will believe to be less likely to show stains, and others just want the color they are most drawn to. The good news is that a lot of times it never matters what color the table is, because it will be covered by sheets and a face rest cover by the time your clients see it! I always tell people to get whatever color they like most. BOLSTERS: One optional accessory I ALWAYS recommend is a bolster. Bolsters are most often used under the knees when the client is laying on their back, or under the ankles when the client is laying on their stomach and they really make a huge difference. 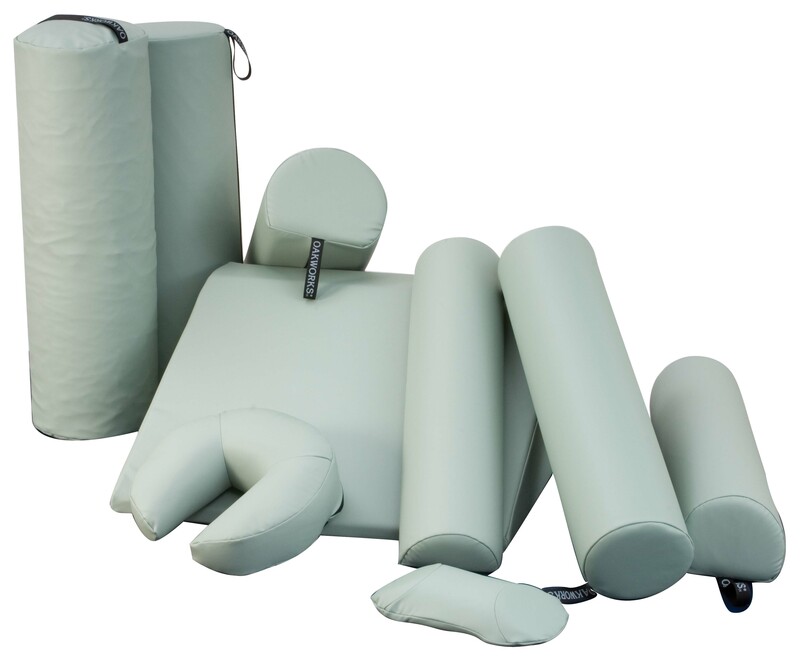 Most bolsters have a semi-firm padding inside that offers support and comfort but will not lose shape over time. If nothing else, a 6″ round bolster is perfect to start with. How quickly can I have my new table in my hands? Tables are often made to order, and crafting them takes time. Some customers believe that even the biggest manufacturers MUST have a warehouse that has tables ready to ship immediately, but most of the time that simply isn’t possible. Having just gone over the options above, there could be 3 styles of headrests, 5 different paddings, 3 different widths, and 25 upholstery colors – 3x5x3x25 = 1,125 tables! And that’s just ONE table… manufacturers can offer 5-10 different models. Typically, tables from Oakworks or Earthlite can be built and shipped within 1-2 weeks, depending on their production schedule. Don’t worry, the wait it worth it! Why do massage tables cost so much? Sometimes even professional therapists can be surprised by the final cost once they decide on options and upgrades. But keep in mind that by performing only 5 massages a week for a year, purchasing a $390.00 table will cost you only $1.50 per massage. A hair stylist doesn’t use cheap scissors to cut hair, and a chef doesn’t use cheap knives to prepare dishes. This will be your tool, so don’t be afraid to get exactly what you need. A high quality table is often very easy to maintain and can last a LIFETIME. I hope this has been informative and helpful! As always, please let me know if you have any questions! ENJOY! Posted on April 3, 2012, in Random, Wellspring Trading and tagged massage, massage table, massage tables. Bookmark the permalink. 1 Comment.